A year after their ‘Entourage’ EP, Tube & Berger now present a remix pack featuring appearances from Joeski, Superlover and German Brigante. 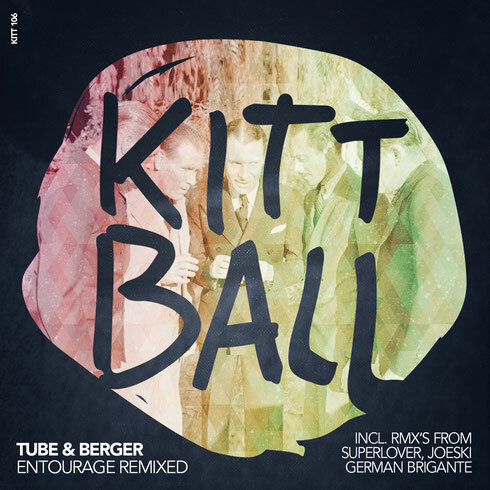 ‘Entourage’ initially saw Tube & Berger team up with Kittball favourites in.deed, Paji and Ante Perry just over a year ago in a three-track release. Another year down the line and the label - who are celebrating a decade long lifespan - have assembled three producers that the German imprint have given much attention to in recent years. New York’s Joeski, who debuted on Kittball in August with his ‘Black Door’ EP, joins the likes of Berlin-based producer Superlover and Spain’s German Brigante for an eclectic medley of renditions. Up first, Tube & Berger’s collab with Ante Perry titled ‘In The Shadows’ benefits from Joeski’s touch, delivering a dub comprised of tribal percussion and trippy atmospherics. Next up, Superlover, who is also one half of DJ duo Kassette Boys, transforms ‘Highness’ into a techy number whilst retaining the original’s heady melodies. Finally German Brigante’s soothing remix of ‘Reliquia’ sees the Spaniard deliver sultry pads, tantalising synths and intricate percussion.